The first pictures of Packard Bell's Valentino Rossi range of products has arrived – with a modified dot netbook the first to show off the motorcycle icon's designs. Moto GP fans will soon be able to get their hands on computers styled by Rossi's personal graphic designer Aldo Drudi. Of course, for the uninitiated the design looks a bit like a montage done by primary school children chucked at a laptop – but there's no accounting for taste. "We are absolutely convinced that users are always seeking an affinity that links the choice of a product to their personal aspirations, to what they want to be and the way they are perceived, " claimed Gianpiero Morbello, Acer Group Vice President of Marketing & Brand. "What they buy is above all the idea that rotates around the product, conjured up by the brand and the visual details in which they manage to identify themselves. "The Valentino Rossi brand has now attained such an international fame that is immediately recognized by most people. "As far as we are concerned, being able to offer our customers the opportunity to experience the 'Valentino dream' through Packard Bell products is extremely rewarding for us, making us very proud." 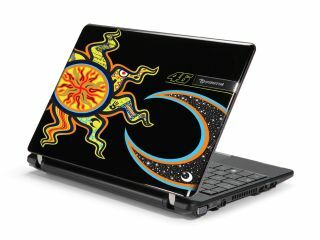 And you'll certainly be able to pick it out of a netbook line-up as well.